(Phys.org)—From petroleum refining to food processing, the vast majority of commercial chemical applications involve catalysts to control the rate of chemical reactions. Anything that can increase the efficiency of catalysts could have a widespread impact in these areas. In a new study, scientists have shown that an efficiency improvement may be possible by creating "hot" electrons (those with a very high energy) from a metallic surface on which the chemical reaction occurs, and using the electrons to control the chemical reaction and make it more efficient. The researchers, led by Professors Peter Nordlander and Naomi J. Halas of Rice University in Houston, Texas, and Professor Emily A. Carter of Princeton University, New Jersey, have published their study on the technique to improve catalytic chemistry in a recent issue of Nano Letters. In their method, the researchers used a visible-light laser to illuminate a gold nanoparticle surface (the catalyst surface) at room temperature. The incoming laser light optically excites surface plasmons on the metal surface, and the plasmons then decay into hot electrons. Because of their high energies, the hot electrons extend further away from the nanoparticles than electrons with lower energies do. If another atom or molecule that can accept the electron is nearby, the hot electron can transfer into that acceptor's electronic states. In these experiments, the researchers adsorbed H2 molecules on the gold nanoparticle surface, a procedure that is commonly performed in heterogeneous catalysis, in which the adsorbed molecules act as reactants. The researchers found, as the main result of their study, that some of the hot electrons could transfer into the closed shells of the H2 molecules and cause the two hydrogen atoms to separate, or dissociate. This process, called "plasmon-induced dissociation of H2 on Au," could improve the efficiency of certain chemical reactions. "In many important chemical reactions, the rate limiting step is the dissociation of closed shell molecules like a hydrogen molecule," Nordlander told Phys.org. "If this reaction step can be 'dealt with' (using our demonstrated hot electron process), the reaction may proceed much faster and require less energy." To measure the dissociation, the researchers exposed the nanoparticle substrate to both H2 and D2 (two atoms of deuterium, a hydrogen isotope containing one neutron). If the hot electrons dissociated these molecules, it would result in the formation of HD molecules. The researchers found that, as soon as they turned the laser on, the rate of HD formation on the nanoparticle surface increased by a factor of 6. They also measured that the rate was strongly dependent on the concentration and size of the gold nanoparticles. The researchers explained that, in a sense, the electrons "do the impossible" because there would be no dissociation without them. 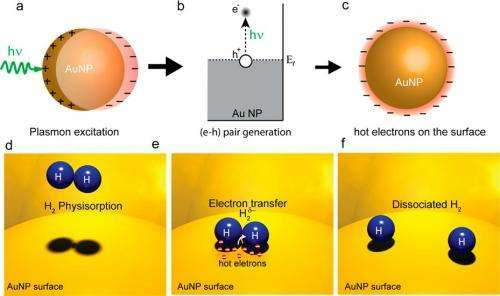 "A hydrogen molecule adsorbed on a macroscopic gold surface does not dissociate spontaneously, even at elevated temperatures," Nordlander said. "It is an impossible chemical reaction. The energy for dissociation is simply too large. We picked the hydrogen-gold system exactly for this reason. We wanted a system where the interpretation of the effect was straightforward. On other metals, like transition metals, a hydrogen molecule can dissociate spontaneously, in particular near defects and at elevated temperatures. But not on gold." These results demonstrate how the field of plasmonics – which involves interactions between photons and nanostructures – can have applications in the field of catalytic chemistry, particularly photocatalysis, The researchers hope that this demonstration of the ability to control chemical reactions using light could be extended for specific uses. By using the laser frequency to tune the surface plasmon resonances, it may be possible to create hot electrons with specific energies that populate specific electronic states of molecules adsorbed on the nanoparticle surface. "The immediate application is to improve the efficiency of metallic catalysts by illuminating them with light," Nordlander said. "Our groups have a very 'green agenda' and our intent is to design novel types of catalysts that are driven by sunlight. This is something we have an abundance of here in Houston. "Another important application is to investigate to what extent we can steer and control chemical reactions by having hot electrons of particular energies transferring into specific molecular orbitals. This is a relatively unexplored research topic. Normal electrons have positive energies and are much 'hotter' that our hot electrons. Such high-energy electrons typically do not stay on a molecule sufficiently long for the atoms to start to move." The plasmonic and lattice effects play a significant role in Widom-Larsen theory of "cold fusion". As Einstein and another physicists knew in 1950 already, the energy for initiation of electron capture can be many orders of magnitude lower, than the naive theories based on peer-to-peer collisions predict. It's an analogy of so-called astroblaster effect: in system of multiple particles you can get into energies, which would be unachievable otherwise. Atoms of gold are heavy, so that their mutual collisions can squeeze and eject the lightweight electrons with high energy, although the mutual speed of gold atoms remains quite low during it. Because of momentum multiplication, just the mutual collision of six-eight particles at the same moment may lead into energies in the kiloelectron volt range.